Few films even start to get at what my spouse and I experience in the ocean when we're scuba diving. But this does, a little. And the scene of the trawler scraping everything off the seabed should be made into a clip and distributed to every organization trying to save the sea from human depredation. 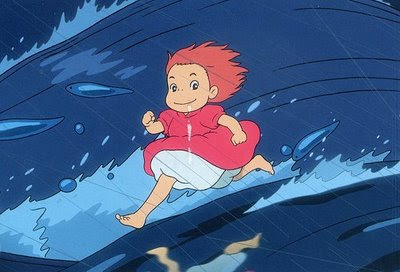 As for Ponyo--we liked it. Little kids will adore it. It's not as sublime as Spirited Away, but what is? It would make a great companion piece to My Neighbor Totoro, though, which is still pretty great company. We're glad we saw it. But--we saw it on our big screen TV, in Japanese, with English subtitles, on what appeared to be a legit DVD from Taiwan (if that's not an oxymoron. So this is a preview of the DVD that will be shipped to American audiences, no doubt in a few months. I say wait for the DVD. As other reviewers have noted, dubbing is an abomination in general, and that's true even for an anime where the mouths are rarely drawn closely enough for the different facial movements for different languages show. But still, it's a Japanese film, and even though everyone looks Caucasian, they act Japanese in every way. You really won't see the movie unless you see it in Japanese with English subtitles. Just wait. I know it's hard if you're a Miyazaki fan, but do it anyway. Vote with your dollars for original language with subtitles. These are serious objections to what I said. I'll address the dub/subtitle issue, then the theatre/home issue. 1. Dub vs. subtitles: C.Moon urges deference to Miyazaki's desires that we see the film in a theater. But I'm sure Miyazaki also wants us to hear what he put on the sound track (at the price of having subtitles, I acknowledge). I don't speak Japanese, but I know something about linguistics. English is something of a classless language, though to be sure all our dirty words come from the Angles and the Saxons who the French knights ruled over after 1066 AD, while most of our hoity-toity words came from those French masters. But Japanese is a stack of languages, each calibrated to your social class and that of the person you're talking to. For example, "I" in Japanese is watakushi, watak'shi, wata'shi, or boku, each variant successively more informal. Likewise, while Americans behave differently depending on whether we're carousing in a bar or attending church, our body language doesn't differ as much as the Japanese culture mandates. For example, the angle with which you bow and the associated body language conveys important meaning about what you believe your social status to be relative to the person you're bowing to. If you're listening to a Japanese movie in Japanese, you can see how their class-conscious spoken language and their class-conscious gestural/facial/body language go together. It goes way beyond lip-synch (which as I said isn't a problem with nearly all animation; not yet at least--someday I expect it will). Also, another review pointed to the care with which Japanese voice actors are cast, and their status in the Japanese arts. They are not an afterthought, and their work is generally serious and nuanced. And after you see a few dozen Japanese movies in Japanese, these nuances will start to come through. You might even consider getting one of those little Lonely Planet pocket guides with a phrasebook etc., or the like. This small investment will pay off handsomely. Perhaps Disney picked the best American voice actors imaginable (though I get the impression they hire Big Names to goose box office, rather than necessarily the best in the business). But say they did. And also say that subtitles are also challenging to do. They'll never get all the nuances; it's just not possible. So either way you're viewing the movie through a filter that reduces your access to the total movie. You must pick your poison, and I could make an argument either way. It's not anywhere near as clearcut an issue as it with live action films, where I find the dubbing intolerable (except when it's intentionally used for humorous effect, a la Mystery Theater 3000). I opt for subtitles, and in doing so I hope I'm pushing the distributors and the film makers to take subtitling seriously and do as good a job as possible. The theater is a great place to take your young children to see Ponyo. I don't have children, however, and for me (except for a few "2001" ish films or ones in 3D) I've found viewing them at home provides a better viewing experience. However, that's only been true since I bought (through Amazon) a 46" 120Hz LCD screen TV coupled with a 6-speaker home theater. Conversely, you can't see "2001" in a theater, even in a revival, because it requires Cinerama, which doesn't exist any more. And even for other films, the screens have gotten smaller and smaller. And the audience courtesy seems to have diminished correspondingly, with some people chattering with each other throughout the film. We don't even have Blu-Ray, but the upconversion qualities of a modern DVD player, coupled with a screen this big in a smallish room (we live in a condo), the angle of view subtended by the screen from your eyeball is comparable to a back-row seat at the average cineplex. And I can control my viewing environment far better than the theater viewer can. I actually find the bright neon EXIT signs somewhat distracting, for example. This TV replaced a 32" Sony Trinitron CRT TV, and I certainly agree that watching movies through that was grossly inferior to seeing a movie in a theater. I've heard, BTW, that the biggest regret big screen TV buyers have is that they didn't buy a big enough one. They went cheap and lived to regret it. I don't believe anything smaller than our 46" unit would be competitive with the theater experience, regardless of room size. Absolute scale matters. The challenge is teaching the people you're watching it with to take the viewing experience seriously and not treat it as you might, say, like watching a lightweight sitcom. It also lets fidgety children move around some and go to the bathroom, if they need to, without forcing you to miss 5 minutes of the film. So though I laud C. Moon's desire to support Miyazaki with theater sales, I'm also supporting Miyazaki with DVD purchases, and with that support I'm also supporting making the DVD product as high quality as possible and not an afterthought. Interestingly, the price for a recent, non-BluRay DVD is pretty comparable compared to tickets for two.Miyazaki's movies deserve to be taken seriously. C. Moon and I agree on this. Where we differ is in what "taking serioiusly" consists of. Spinoza defined freedom as arranging your chains as comfortably as possible. I think that's germane to the topic of seeing movies in theaters vs. on DVD. Actually Hollywood did figure out how to get film buffs like me back into theaters: 3D. It won't be possible in homes for years, and probably never on my own $2K investment. We've seen "Bolt" and "Up" and in both the 3D was sublime--a far cry from "Bwana Devil" of the '50's with it's poke-you-in-the-eye crudity. Now try to imagine a 3D Miyazaki film. As for bootleggery--like you I'm sure, I won't knowingly buy a bootleg DVD, nor allow my own DVDs to be copied for someone else, neither for money nor for free, unless they're out of print. The Ponyo I saw was brought here by some friends who bought it in Taiwan while they were visiting relatives. They're holy rollers (hence honest I hope), and the packaging looked legitimate to my superficial inspection, but I know what percentage of Asian DVDs are boots (nearly all). It could only be played on a region-free player, however, since it wasn't region 1. So perhaps it is legit, else why do a bootleg with region copyright protection? I hope that's the case. And the downside was that the friend's player didn't have the upconversion capabilities of my player. So I'll have to see it again when the American DVD is released. I have a wish for DVD I hadn't mentioned--the hope that miniseries will someday be released straight to DVD, perhaps with TV airings of their pilots. So many shows I've loved have been cancelled (Wonderfalls, Dead Like Me, Pushing Daisies, Firefly, Life, to name a few) prematurely. Perhaps if DVDs become more accepted such series can continue on DVD. For example, DVD sales of Firefly were robust enough to justify a feature-length sequel in the theaters (which did a miniscule fraction of the business of a Star Wars film, despite being vastly better by any measure). As for projection TVs--I think they're terrible. All that I've seen at least. Dim and grainy. My TV has true 1080p resolution and great contrast and saturation. It's really a different ballgame than any projection TV I've seen. I do understand the argument for an immersive experience. That's why I saw "2001" 13 times in a Cinerama theater in San Francisco--not because the story itself was that great, but because at the time it was best way to experience deep space. I think it was far better than IMAX, which usually feels like sitting in the front row of a theater, even if I'm all the way back. And the form factor--pretty much square--is inferior to Cinerama's. Sigh. "2001" is the most immersive movie I've ever seen. "Apollo 13" was good, too. "Lawrence of Arabia" of course. Perhaps Kurosawa's "Kagemusha" and "Ran." "Saving Private Ryan"'s first half hour. "Grand Prix." Actually the most immersive experience most humans can have is scuba diving, which my spouse and I do. That's one reason I liked Ponyo so much, as my review noted. And no, I don't mean it's because you're immersed in ocean. It's the visual universe you experience underwater. Beyond amazing. We go diving in Indonesia pretty much every year, and I recommend it for any Miyazaki fan. His reverence for nature and appreciation of stillness dovetail perfectly with what we've experienced. OTOH I can't immerse myself in a nice big theater when yahoos are talking around me. You can avoid that to some extent by going to the first matinee, but it's still a crapshoot. In an ideal world I'd have a wall-sized screen in our home or have the wherewithal to book a theater. I saw Jurassic Park that way (one of the computer companies involved had booked the theater and I got invited). That was pretty cool. And we certainly loved seeing "Bolt" and "Up!" in a theater. Theater vs. home theater--from a viewer's perspective, each is better than the other. Pick your trade-offs. If you want a truly cool theater experience, I recommend the movie theater in Casino Point in Avalon on Catalina Island, near LA, which is a fully restored Art Deco movie palace; the Stanford Theater here in Palo Alto, also fully restored (only shows old films though); and the Sony Metreon in San Francisco, which has 3D/Imax capabilities, and the Pacific Film Archive in Berkeley, with fab projection facilities and an endless repertoire of art/foreign films. I practically lived there when I lived in Berkeley. It's only in the last two years that home viewing became competitive with good theater viewing. If you haven't tried a state of the art LCD big screen--it's time. I realize the studios mostly make decisions based on theater box office, but I think this new technology is so good that this will change soon. Especially since with Amazon and whatnot it's possible to have discussions like this about movies--we aren't so dependent on mainstream promotion to decide what to see. As for subtitles--not for a kid film in a theater, of course. Late night showing is an interesting idea. Reminds of those Rocky Horror Picture Show midnight showings that went on for decades. Would we all go dressed as anthroporphic fish? BTW subtitles are a must for the hearing-impaired. We have a nearly deaf friend who always needs them even for movies in English. So for her our home theater is 100% preferable to a movie theater. One last note--films can be immersive in ways other than visual. The French film "Ponette" immerses you in the inner world of 5 year old children--a remarkable achievement. Visually it looked made for TV, but that didn't matter a bit. Or the documentary "Born into Brothels" which will rip your heart out and squish it into little red bits, despite, again, being visually unpreposessing. Or another French film, "Water Lilies," which immerses you in the obsessions that can swamp the mind of a teenager (I wrote a review of in in Amazon--check it out). Or "Groundhog Day" the first Zen Hollywood comedy, which immerses you in time itself as a human dimension, or "Lost in Translation" which immerses you in stillness and unspoken longings. Or the art museum segment of Kurosawa's "Dreams," which immerses you in Van Gogh's head, or, similarly, "Being John Malkovitch"--I'm thinking of the Malkovitch Malkovitch restaurant scene.